We have 10 Paperback copies of The Mottos to giveaway to UK readers. The belief that relationship success should come naturally and bring endless joy means that people are embarrassed about seeking help or buying a book for guidance, as they think the magic should happen automatically. It never occurs to them that guidance and skill are exactly what is needed to create the magic! This is where this book comes in. It takes a positive, theme-based, rather than rule-bound, approach to sustaining great relationships – hence the title, The Mottos. We all live our life by our favourite mottos, which we hear about from childhood. 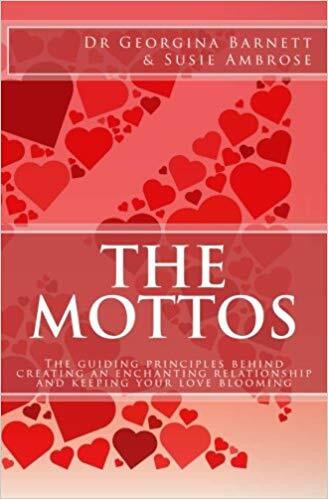 Mottos are phrases which encapsulate wisdom that we endeavour to live our lives by, and this book gives you the mottos to build and maintain a wonderful relationship.